This model IM-609 is one of our popular selling prodcuts which is a PolyCotton Inkjet printing art canvas. Fine textured Matte surface. 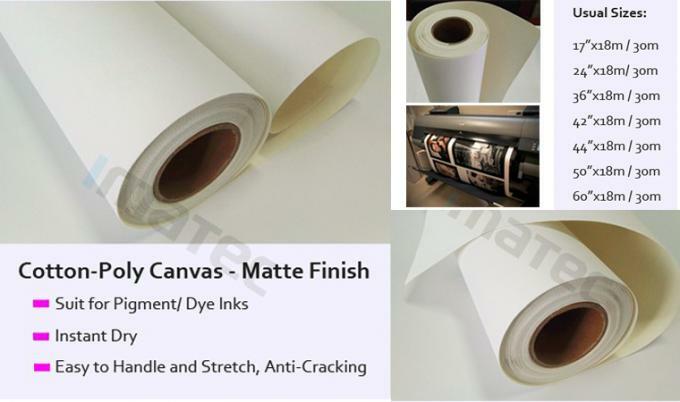 Gram weight of this model is 420gsm.It has an excellent ink control and absorption,when stretching canvas,there is no cracking or tearing.This canvas is suitable for Canon,Epson,HP etc. large format printers with water based inks. It's widely used in Commodity display, Personal/Wedding photos, Roll-up,Interior decoration,Indoor and outdoor advertisements,Posters so on. Usual size is 24", 36", 42", 44", 50", 60"*30m/roll. OEM service is also accept.